As a parent, you want your child to succeed in life. Although college might not be right for everyone, most parents will probably agree that giving their children the opportunity to attend college is a path for success. Unfortunately, providing a child with that opportunity comes at an expensive price, and so parents worry about how they’ll pay for college when the time comes. What might surprise you is how concerned they are about this dilemma. According to a recent Gallup poll that collected data from 2001 to 2015, having enough money to pay for college is the most common worry among parents who have children under age 18. Fortunately, there is a way to ease some of the concern: by starting to plan for future college expenses as early as possible. Security – The Gerber Life College Plan is an individual endowment policy that matures in 10 to 20 years (you select the duration), and that has built-in adult life insurance that provides protection in case the insured person (usually the parent) passes away before the policy reaches maturity. Your child, as beneficiary, would still receive the full coverage amount. The College Plan enables you to provide a safety net for your child. 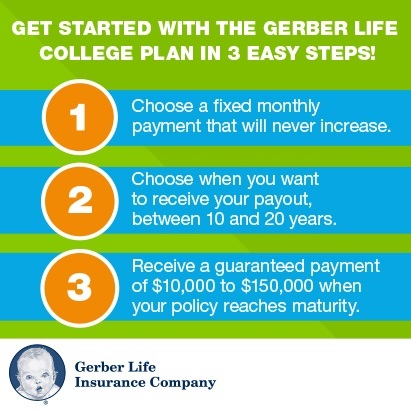 Flexibility – Unlike traditional 529 plans or educational IRAs, the payout money from the Gerber Life College Plan does not have to be used for higher education. Therefore, if your child should one day say “no” to college, the money could go, for example, toward starting a business, attending a technical school, or whatever direction he or she might want to take. You’ll also have the option of deciding the size of the guaranteed payout, from $10,000 to $150,000, as long as your premiums are paid. 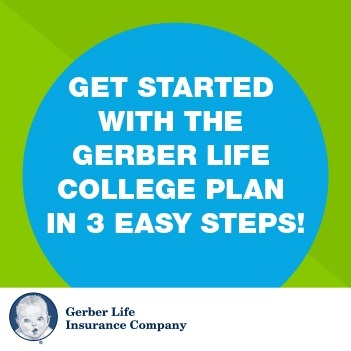 Stability – With the Gerber Life College Plan, there’s no need to keep a constant eye on the stock market. The policy builds cash value over time, and its growth is stable and guaranteed by the Gerber Life Insurance Company. Additional information is available on the Gerber Life website.